Will Your QuickBooks File Stand Up To An IRS Audit? As A Contractor You Get - A lot of attention from the local, state and Federal tax agencies because by nature you spend most of your time standing up, moving around, building, remodeling, repairing, maintaining stuff that makes civilization possible; and not enough time and energy on your construction bookkeeping. Construction Accounting And Bookkeeping - Involves a lot of sitting, intense reading, boring, routine, mundane work and a whole lot of continuing education classes and seminars. It is like flying an airplane, 98% boredom with 2% sheer terror! So You Tend - To put it off as long as possible or find a cheap bookkeeper and both options end in pain and tears. It Is Old News - To most accountants that the Internal Revenue Service (IRS) can ask for an EXACT COPY of your QuickBooks file and that they have been training some of their staff in how QuickBooks works so they can get better at helping you pay your fair share of taxes. If You Are Interested - Click on the button below to download a copy of the letter sent from the IRS sent to Patricia Thompson Chair of The American Institute of CPA's on April 20 2011. First And Foremost - Compliance with the laws, rules and regulations makes sense and spending your time and effort earning money is where it is at and we know you feel the same way. As A Contractor - You deserve to be wealthy because you add value to other people's lives. So when you focus your time and energy on your construction company's core competencies you earn more money; it is just that simple. 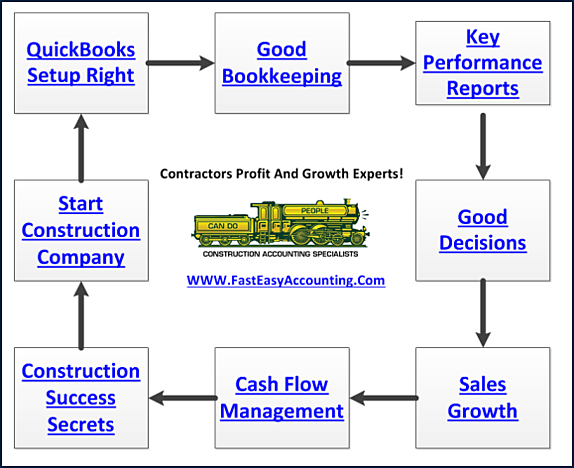 You get paid for your construction work; you do not get paid for doing construction bookkeeping. When You Spend Time - On construction bookkeeping it is like a Nickel holding up a Five Dollar Bill! It makes no sense to try to save Nickels when you can be earning Five Dollar Bills instead. S.W.O.T. Strengths, Weaknesses, Opportunities, Threats - When your construction company earns a lot of money it is because you are focusing on your Strengths. Outsource - Everything that does not directly affect your customer to companies whose core competency is doing those things because they feel the same way you do about your construction company and they can do it better, faster and save you time and money. Shift The Time And Energy - You were spending on the things you outsource into new innovations that add value to your prime customer and watch your construction company grow and prosper. Audits Are - A fact of life; do your best to have a clean set of QuickBooks, set aside money in a separate bank account and pay your taxes on time, do the right thing and you will sleep good knowing you deserve to be wealthy because you add value to other people's lives. Let Us Handle - Your Construction Accounting and Bookkeeping and focus on what you do best. You Can Have - 24/7 remote access to your desktop version of QuickBooks and we can arrange for a scanner to be placed in your office so that no construction bookkeeper comes to your office. P.S. If You Are - Have tax issues, behind on tax payments or have unfiled local, state or Federal tax returns contact us and we will do our best to help you. Please understand we play the tax game on the straight and narrow and we have found ALL TAX AGENCIES willing to work some kind of payment plan as long as your intent is to get on the straight and narrow. P.S.S. We Handle - Emergency bookkeeping and accounting issues because of our "Easy Accounting System".